The Gallipolis Daily Tribune’s Golden Easter Egg has been found. The annual contest sent locals scrambling to find the egg worth $200. Pictured are the lucky hunters, Joe Shuley and Tracy Calvert of Gallipolis. The pair found the egg where it was hidden by Tribune staff - at the gazebo at Mound Hill Cemetery in Gallipolis. The Gallipolis Daily Tribune’s Golden Easter Egg has been found. The annual contest sent locals scrambling to find the egg worth $200. 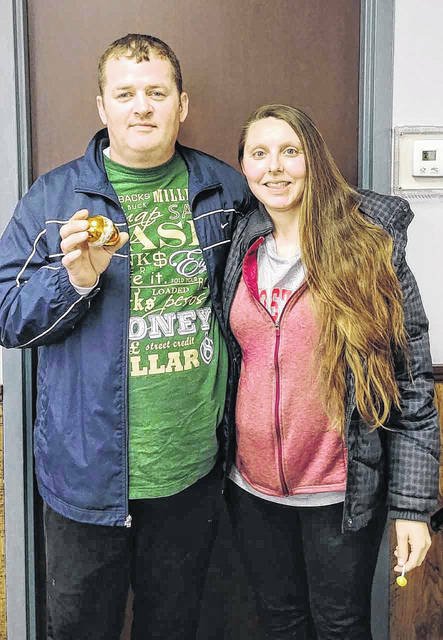 Pictured are the lucky hunters, Joe Shuley and Tracy Calvert of Gallipolis. The pair found the egg where it was hidden by Tribune staff – at the gazebo at Mound Hill Cemetery in Gallipolis.